Saying it has "listened to the feedback," Electronic Arts has decided to ditch the hated Online Pass. Return with me now to the golden days of yesteryear, specifically 2010, when EA threw the world into a tizzy with something called "Project Ten Dollar." 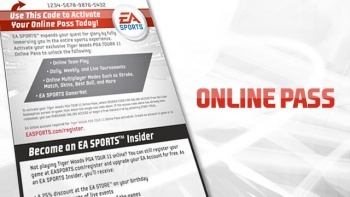 A few months later, EA Sports jumped on the bandwagon and gave it a much catchier name, Online Pass, which would soon become a generic term for in-game content that gamers must buy separately when purchasing a used game. Publishers claimed online passes were meant to protect them from losses incurred by preowned game sales, from which they receive absolutely no revenues, but many gamers saw it as nothing more than a straight-up cash grab. They swallowed it, of course, because that's what gamers do, but they didn't like it, and while time passed, that burning anger and frustration didn't fade. Even so, the practice grew more and more widespread, and today it's just about everywhere: Sony, Square Enix, Bethesda, Ubisoft and others have all incorporated it into their games at one time or another. But soon there will be one publisher who won't be using it, and that publisher - as you already know if you read the headline - is none other than the one that inflicted all of this on us in the first place. "Yes,Â we're discontinuing Online Pass," EA Senior Director of Corporate Communications John Reseburg told VentureBeat. "None of our new EA titles will include that feature." "Initially launched as an effort to package a full menu of online content and services, many players didn't respond to the format," he explained. "We've listened to the feedback and decided to do away with it moving forward." There's no arguing the point that gamers didn't respond to it, but while this is good news for those who were staunchly opposed to the concept, it does leave one rather important question unanswered: What comes next? I don't believe that EA is so institutionally evil that it will be compelled to come up with something even worse than Online Pass, but there's no question that it's going to come up with something. "We're still committed to creating content and services that enhance the game experience well beyond the day you first start playing," Reseburg said. Boy, I can't wait to see what's next.